French Narrator: The artist has learned the first lesson of the sea- always bring a spare pencil. SpongeBob: Three! Patrick, how come you always do paper? Patrick: What is that thing, SpongeBob? SpongeBob: It looks like a giant pencil. SpongeBob: It is a giant pencil, Patrick! (runs up to it) Let’s draw some giant pictures with it! Patrick: (now standing behind SpongeBob) Whatcha drawin’? SpongeBob: Stand back, Patrick! I can’t draw with you breathing down my neck. Patrick: Pretty good, SpongeBob…but it’s lacking basic construction, and your perspective leaves a lot to be desired. Patrick: SpongeBob, your drawing’s coming to life! SpongeBob: Now, that’s more like it, Mr. Critic. Patrick: No! I mean it’s swimming away! SpongeBob: Do you know what this means, Patrick? Patrick: Your art can never hang in a museum. SpongeBob: It means we found a magic pencil! Patrick: (clapping) Now all I need is a magic moustache, and all my dreams will have come true. Patrick: Life is good!! (the moustache swims away) Easy come, easy go. Squidward: (inside his bedroom) Squidward, if you had some hair, you’d be the most gorgeous creature in the sea! You’ve got looks, talent, all you need is a full head of… (the moustache lands on his head) hair! SpongeBob: Be careful, Patrick. Being an artist is a heavy responsibility. (cradling the pencil) Each work of art is like a child and must be treated as such. Patrick: Come on! I was just gonna draw a cartoon. SpongeBob: Ok! Why didn’tcha say so? (Patrick draws something.) Hey! Another jellyfish! SpongeBob: It’s kinda creepy lookin’ when it moves. SpongeBob: This is gonna be classic! Squidward: (wearing the moustache as a wig) I think I fancy a stroll around the park. SpongeBob: (off camera) Oh, Squidward! SpongeBob: Wait! I’ve got another idea. This’ll be the ultimate prank! I’ll draw me, and when Squidward answers the door…it won’t be me!! 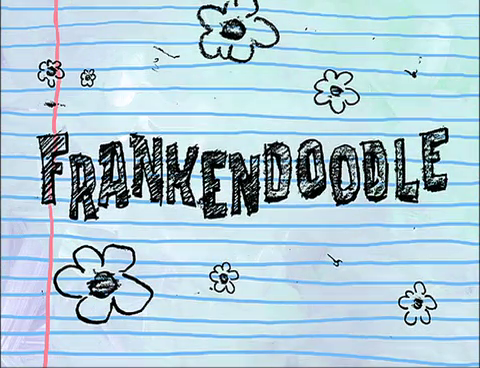 (SpongeBob draws a doodle of himself, Patrick laughs. The drawing stands up.) Aww, look at ‘im. Ain’t he a doll? All he needs is a tie. (draws a tie on the doodle) Ready for action! Patrick: He’s going to the door. Squidward: Ooh! Ow, ow! Ow, ow-ow-ow! Patrick: He’s beating up Squidward! Ha ha ha! Patrick: He’s got the pencil. SpongeBob: What have I done! We’ve gotta find him. SpongeBob: Where could he possibly be? Patrick: Maybe he’s in that poorly drawn pineapple. SpongeBob: Come on! Let’s go. Patrick: I’m not goin’ in there. SpongeBob: Come on, Patrick, give me a boost up. Patrick: Can’t we just stay down here where it’s safe? SpongeBob: No way. I created this monster, and I’ve gotta stop him. (A large wrench suddenly falls on Patrick’s head, and we can hear DoodleBob speaking again.) See what I mean, Patrick? Patrick: (with an out-of-it look on his face) Where’s the leak, ma’am? Patrick: He’s hideous. He makes me sick just lookin’ at ‘im. Those big, bulgy eyes. That square body. (SpongeBob is looking at Patrick weirdly as he talks.) Those two buck teeth… and that stupid tie! SpongeBob: (clearing his throat) Uh…hem. Patrick: (blushing) Oh, but it looks good on you, SpongeBob! Eh, heh heh. SpongeBob: (turning his attention back to DoodleBob) He’s puttin’ down the pencil! This is our chance! On the count of three, we’ll jump out and surprise ‘im. Patrick: Oh boy! A surprise party! Is it his birthday? SpongeBob: Patrick, Patrick!! Do something!!! Patrick: Happy birthday! (DoodleBob tosses SpongeBob off screen.) Here’s your present! (Patrick hands DoodleBob a rock, which DoodleBob slams on his head.) You’re welcome. SpongeBob: (holding the pencil, eraser side pointed at DoodleBob) Hold it right there, Doodle. I brought you into this world, and now I’m gonna take you out. Any last words? (DoodleBob rattles off something unintelligible) Eh, I’m sorry, what was that? (DoodleBob repeats his jibberish, slower this time, then jumps up and rattles off some more while SpongeBob erases his face. DoodleBob then runs into a rock.) Hold still, Doodle. This is for your own good! Take that! And this! And this, and that! And this, that, this, that! Aaaaaaaaaaaaaaahhhhhhh! (holds up the pencil over his head, victoriously) I am SpongeBob, destroyer of evillll!! Patrick: Take it easy, it’s just a drawing. SpongeBob: Well, that takes care of that, eh Patrick? SpongeBob: (only noticing the pencil moving by itself) Oh, hey magic pencil. What are you doin’ up? Drawing yourself a glass of water? Dahahahah!!! (notices DoodleBob) Aahh!! DoodleBob! Eh, heh heh…no hard feelings, right? (DoodleBob draws himself some angry eyebrows, then hops on SpongeBob’s bed.) AAAHH!! What do ya think you’re doing, Doodle? SpongeBob: (backing away from DoodleBob) Aaahh! Be careful with that thing! Who knows what’ll happen? (DoodleBob erases his nose.) I knows. Squidward: (off camera) Ouch!! SpongeBob, you’re gonna pay for that! SpongeBob: Uh, maybe it was most clumsy. Patrick: (coming in the front door) Hey SpongeBob, what’s with all the ruckus? Patrick: It’s the evil doodle! SpongeBob: No, no…not evil. He was just a two-dimensional creature lost in our three-dimensional, aquatic world. Longing for a purpose. SpongeBob: Exactly! See how happy he is? Patrick: He still looks kinda creepy. SpongeBob: Oh great, magic pencil, your powers are too mighty for us ocean dwellers. So, I will send you back to the magic kingdom, from where you came. Are you ready, Patrick? French Narrator: We rejoin the artist, in a creative slump. French Narrator: The second most important rule for the artist at sea- Always bring a pencil sharpener.